If you want to replicate the kinds of backlinks your competitors have, you’ll need to learn from the content on their site that attracted their links. That’s where the Indexed Pages report comes in. Here it’s easy to check out the content on your competitor’s website that attracted the most backlinks. This will help if you need ideas for your link building campaign or simply to build out your website to cover more topics. Having a high number of backlinks means that the content is valuable and trusted among Internet users and other websites, so this is the type of content you should plan to have on your website. Sort by the number of referring domains or total number of backlinks pointing to the URL to find your competitor’s most attractive content. If you click on either of these numbers you’ll be sent to a filtered Referring Domains or Backlinks report for the corresponding URL. In the table you will also see the number of external and internal links that were found on each URL, and the date that SEMrush last saw the indexed page. This is also an important metric to take note of, since internal links can pass along SEO value. 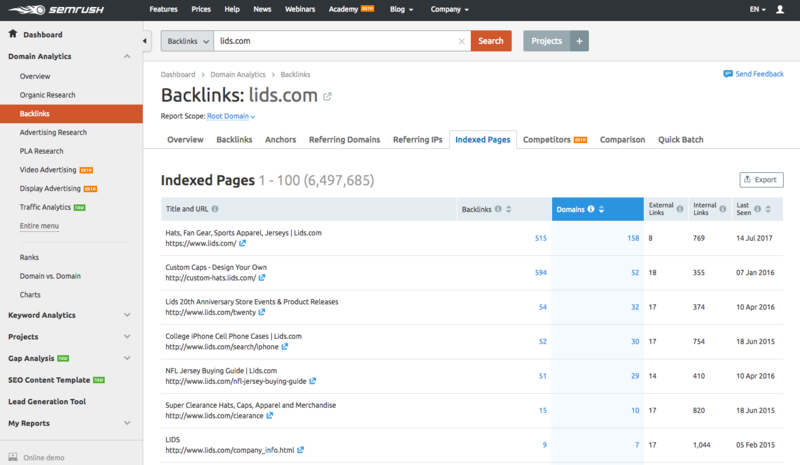 Look at how many internal links your competitor’s top page sends to other pages on their website. Using internal links to direct traffic throughout your website and pass downlink value is a simple and effective way to help your website’s SEO. Let’s say for example that you have a buying guide infographic on your website, but on the landing page of your buying guide, there are no internal links to explore the rest of your website. What a missed opportunity! Instead, you should capitalize on any content on your website that is receiving referral traffic by adding internal links to the important pages of your website - pages where visitors can make a purchase, sign up for a newsletter, or contact you. As with all of our reports, this data can easily be exported to excel, CSV, or CSV semicolon so you can organize your research.